Märzen or Märzenbier (German: March or March beer, respectively) is a lager that originated in Bavaria. It has a medium to full body and may vary in color from pale through amber to dark brown. It is the beer traditionally served at Oktoberfest. Märzen (or alternatively Maerzen) has its origins in Bavaria, probably before the 16th century. A Bavarian brewing ordinance decreed in 1553 that beer may be brewed only between 29 September (St. Michael's Day or Michaelmas) and 23 April (St. George's Day or Georgi). The Märzen was brewed in March (März in German is "March") with more hops and slightly higher alcohol content that would allow the beer to last while the brewing of new beer was forbidden from 24 April to 28 September. The original Märzen was described as "dark brown, full-bodied, and bitter". The beer was often kept in the cellar until late in the summer, and remaining bottles were served at the Oktoberfest. The style is characterized by a medium to full body, a malty flavour, and a clean dry finish. In Germany, the term covers beers which vary in colour from pale (Helles Märzen), through amber to dark brown (Dunkles Märzen). 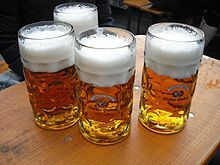 Common names for Märzen include Märzenbier, Wiener Märzen, Festbier, and Oktoberfestbier. The Austrian style is light in colour, body, and flavour balance, and is the most popular beer style among the beers in Austria. Austrian Märzenbiers often use caramel malts that impart a sweeter flavour than their German counterparts. Brewers in the Czech Republic also produce pale, amber, and dark beers in the Märzen style, called respectively 14° Světlé Speciální Pivo (light special beer), Polotmavé Speciální Pivo (half-dark special beer), and Tmavé Speciální Pivo (dark special beer). Żywiec, a Polish brewery, produces a Märzen style lager called piwo lager typu marcowe (March type lager beer), or simply "Marcowe". ^ "Oekonomische Encyklopädie" by Johann Georg Krünitz, 1773, vol. 5 page 156. ^ "Bierspezialitäten". Märzen. Deutscher Brauer Bund. Archived from the original on 2001-11-22. Retrieved 2006-11-02. This page was last edited on 18 April 2019, at 01:59 (UTC).